Measures light in the wavelengths 250-400nm. Some sensors cover the full band while other seperate UVA and UVB. This sensor has a response closely matching the ultraviolet Erythemal Action Curve, the portion of the solar radiation spectrum usually associated with sunburn and skin cancer. Two sensors designed to measure ultraviolet wavelengths: UVA (315-380nm) and UVB (280-315nm) parts of sunlight. 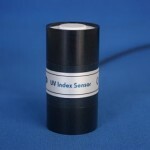 The following sensors measure in the ultraviolet range. Please click the Related Pages links for more information. The Apogee MU-100 handheld meter is for general outdoor use and measures between 250-400nm covering the UV-A,B & C ranges. It is commonly used for plant studies. Skye has sensors that measure specifically in either the UV-A (315-400nm), UV-B (280-315nm) or to match the erythemal response curve (UV Index), a measure of how human and animal skin reacts to UV.